APASEO EL GRANDE, Mexico — Angelica Cervantes has big dreams for her small family-owned business that makes specialized hand-crafted tools used by giant automakers like Ford, Volkswagen, Nissan, Mazda and Honda. She hopes that her tool and die company, which has about 25 workers, will grow to employ hundreds and help make this city of 85,000 in the central state of Guanajuato a key link in Mexico’s rapidly growing auto industry. 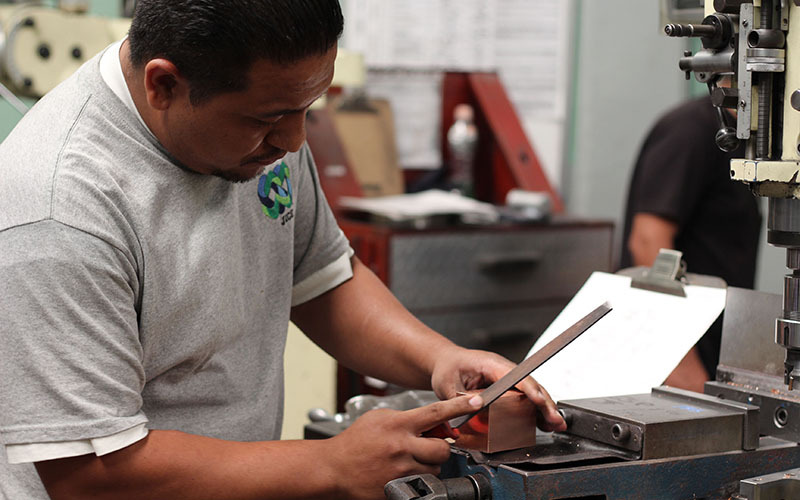 This one-room manufacturing center where workers like Julio Cesar Gonzalez Mendoza painstakingly file large blocks of metal to form custom tools, is not the first kind of business that comes to mind when President Donald Trump talks about U.S. manufacturing jobs lost to Mexico. But small companies like the Cervantes’ are part of a large and crucial supply chain that has developed across borders since the passage of the North American Free Trade Agreement in 1994. NAFTA, which eliminated tariffs between the U.S., Mexico and Canada, has changed the structure of the North American auto industry. While the U.S. has maintained its position as the second-largest auto producer in the world, Mexico has climbed from obscurity to rank seventh, according to the U.S. International Trade Association. The Economic Policy Institute, a left-leaning Washington D.C.-based think tank, estimated that 700,000 jobs in the U.S. moved to Mexico because of NAFTA, mostly from manufacturing-heavy states like California, Michigan and Texas. About 108,000 of the estimated jobs lost were related to vehicles and parts. Trump has described NAFTA as a “disaster” and the “worst trade deal” the U.S. has ever made. He has recently backed off a promise to repeal it, but said he would still make significant changes to the trade agreement. But changes to NAFTA could have devastating effects on both sides of the border. 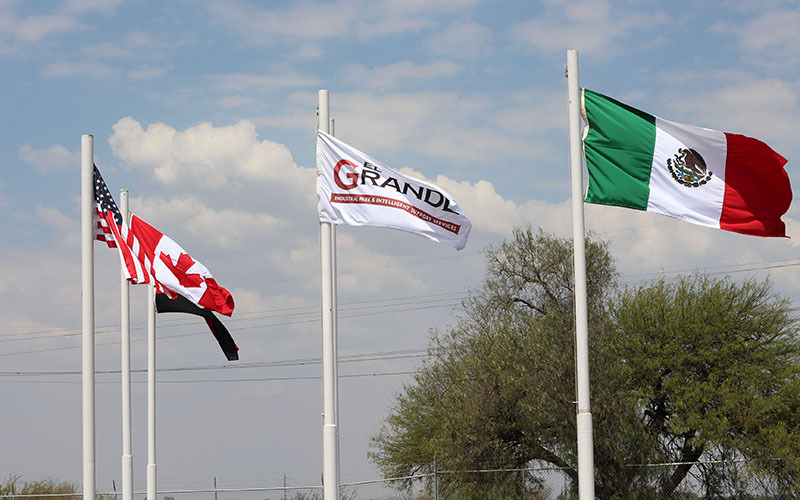 In Mexico, some local auto suppliers, such as the Cervantes family, worry that repealing or changing the trade agreement would take away the incentive for foreign auto companies to invest in Mexico. In the U.S., an estimated 31,000 jobs could be lost if the 35 percent tariff on imported light vehicles and auto parts proposed by Trump is implemented, according to the Michigan-based Center for Automotive Research. Such a switch would also cost American companies more to produce vehicles to meet U.S. demand. The U.S. is a large consumer of light vehicles produced in Mexico; 55 percent of Mexican-produced light vehicles were exported to the U.S. in 2016. Companies would have to expand their plants in the U.S. or build new ones if the Mexican imports are blocked, costing them $4.7 billion to $6.5 billion in new capital costs, according to the Center for Automotive Research. American consumers ultimately would foot the bill. CAR estimates that the price of light vehicles in the U.S. would increase by 5.6 percent in response to a border adjustment tax, a tax on imported goods which is one of Trump’s proposals. The average new car in the U.S., which currently costs $34,968, would increase by about $1,970, according to CAR. Beyond the impact on American consumers, Mauro Guillen, director of the Joseph H. Lauder Institute at University of Pennsylvania, said alterations to NAFTA would hurt Mexican companies who rely on serving the U.S. market. “There would be a lot of hardship in Mexico, there’s no question about it,” Guillen said. About half of Mexico’s 130 million people live below the poverty line. Foreign investment in industries like automotive and aeronautics in states like Guanajuato and neighboring Queretaro have contributed to a growing middle class. Since NAFTA went into effect more than two decades ago, the costs and benefits have drawn mixed reviews. Opponents in the U.S. criticize the shift of jobs past the southern border and supporters praise the increase in trade between the U.S., Canada and Mexico. U.S. exports to Mexico since NAFTA was implemented increased by 455 percent from $41.6 billion in 1993 to $231 billion in 2016, according to the Congressional Research Service. U.S. imports from Mexico had an even bigger jump, increasing by 637 percent from $39.9 billion to $294.2 billion in that same time period. But for all the criticism Mexico receives for the growing number of jobs in the auto sector, CAR’s director of industry, labor and economics, Kristin Dziczek, said the perception that American companies are moving to Mexico is false. Mexico wasn’t always poised to let the auto industry flourish. In the early 1960s, the Mexican government implemented the Mexican Auto Decrees, which created a more insular auto sector in the country. The decrees slapped tariffs of up to 25 percent on automotive imports, put restrictions on auto production by foreign companies, required large contents of domestic product in foreign manufacturing and did not allow finished vehicles to be imported into Mexico, according to a 2017 report by the Congressional Research Service. Though the Mexican government eased the requirements by 1989, it was only after NAFTA was implemented that the trade restrictions were axed, something that the Mexican government acknowledges. “Growth in Mexico’s share of the United States imports can be attributed mainly to NAFTA, investments by carmakers established in Mexico and the quality of vehicles manufactured here,” according to a report published by ProMexico, a division of the Secretary of Economy. When Luis de la Calle, one of the original top NAFTA negotiators, was working to craft the trade agreement that connected the continent, he said his expectations for NAFTA were different than most of the world. De la Calle said the auto industry experienced large growth within its own sector and that repealing or changing NAFTA would make the U.S. and North America as a whole far less competitive in the global auto industry. To the NAFTA critics who argue that workers in the U.S. could have the jobs that shifted south to Mexico, de la Calle points out that automation could cost them their jobs. Auto companies have had a presence in Mexico since the early 20th century. Companies such as Daimler and Renault first came to Mexico in 1910, and Daimler now has 8,000 employees in the country. Buick and Ford made their way to Mexico in the 1920s, followed by companies ranging from Nissan to Honda to Mazda. And it’s not just if NAFTA is repealed that the North American auto industry could be disrupted – seemingly small adjustments could have widespread effects. The size and scope of the burgeoning auto industry is not to be scoffed at. 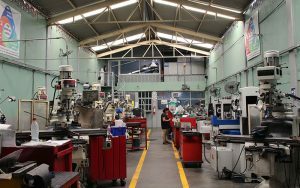 The auto and auto parts industry represented 3 percent of the country’s GDP and 18 percent of Mexico’s manufacturing GDP, according to a report published by ProMexico. In terms of value, the auto industry made up 27 percent of the country’s exports. Former first lady Margarita Zavala, who is campaigning to be the presidential candidate for the conservative National Action Party in 2018, said the auto industry isn’t just a crucial part of her country’s economy, but of the United States’ as well. But NAFTA hasn’t helped all industries or parts of Mexico. Large auto manufacturing companies and states like Guanajuato, which has the resources, workforce and infrastructure, have benefited from the trade deal, while poorer, rural areas of Mexico have not. Jorge Oliveros Jair-Nara, director of economic development in the state of Guanajuato, said the state is well equipped to welcome auto manufacturers, but they play a larger role in a global economy. Marco Antonio Pardo, a business developer for the new El Grande Industrial Park in Guanajuato, is expecting 22 auto companies to put down roots in the 70-plus acre park in Apaseo El Grande. 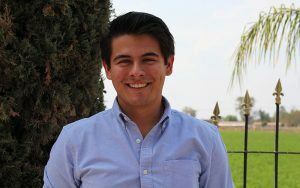 The 24-year-old engineering graduate said the proposal to change NAFTA, along with companies being pressured not to expand in Mexico worries him, and the park is already looking to attract other foreign companies. Employees working in vehicle and parts manufacturing in the U.S. make around $21/hour, according to the Bureau of Labor Statistics. Autoworkers in Mexico are compensated much less, with companies such as Volkswagen paying workers about $7,500 pesos, or $400 U.S., per month, according to auto union communications director Gabino Jimenez. Though Mexican workers’ wages are much lower than their American counterparts, people are still lining up to work despite the uncertain job stability and comparatively low pay. Mexican autoworkers like Juan Carlos Sanchez Ugalde look to new opportunities to work in manufacturing, as it pays better than other sectors of manufacturing in Mexico. Sanchez Ugalde rides his bike home from his manufacturing job in Caleras de Ameche, Mexico, about 10 miles from Apaseo El Grande in Guanajuato. The father of seven works at a Spanish steel supply company but is hoping to get a job at the new Toyota plant that is expected to open in 2019 and bring 2,000 jobs to the region. Toyota is one of the latest auto companies to announce an expansion into Mexico, with people like Sanchez Ugalde hoping to work for the company and othersr like the Cervantes family vying for its business. Jimenez, the communications director for the union RED de Sindicatos Automotrices, said the Mexican government has been quick to accommodate foreign companies, but workers are worried that promises of higher wages will not be fulfilled. He added that most Mexican workers want to be paid the same as their foreign counterparts. His sentiment was echoed by Sanchez Ugalde, who said skill level and technical training has become a bigger factor in recruitment of autoworkers.